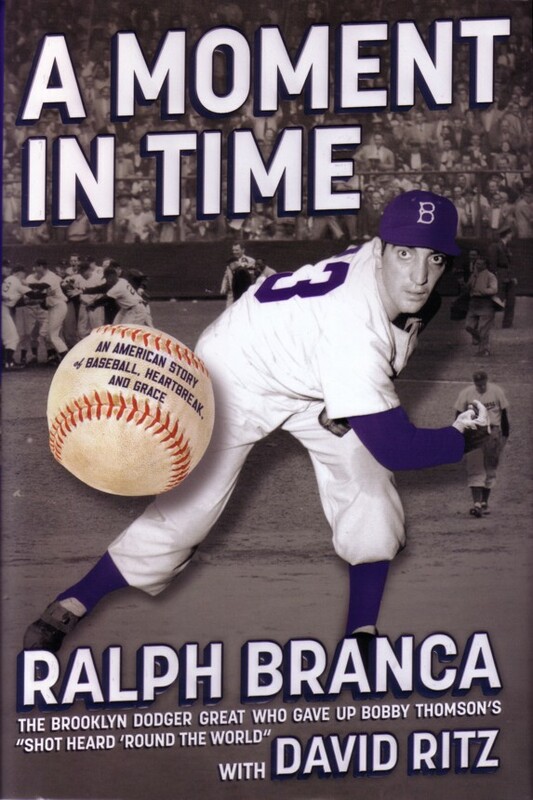 Last week I ordered the book, A Moment in Time, the Ralph Branca Autobiography and I received it yesterday. I have literally been unable to put it down. It's an amazing story told by a Dodger that was about as good a man as we would ever know. 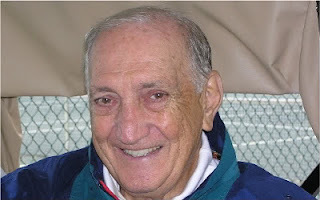 I met Ralph Branca very briefly in 1998 when I had a day in FLorida and I drove over to vero Beach right when the Dodger Adult Baseball Camp was going on. I sat in the Holman Stadium stands and watched Ralph Branca interact with the campers. I struck up a conversation with him when I retrieved a few foul balls and brought them back to him at the dugout. He was outgoing, friendly and kind. Imagine if you will that you were the victim of a colossal fraud. It was something that happened to you in a public setting. So public a setting that millions upon millions saw it. To make matters worse, the world blamed you for what was perceived to be your mistake. Your failure. You are seen as a person that choked under pressure. You are the poster boy for “goats.” No matter how many successes you have in life, (and there are many), you are solely remembered for what everyone thinks was your screw up. You shoulder the burden of your failure, because you were unaware of the fraud that was perpetrated against you. Years pass and the stigma of your failure hangs with you. Your name is recognized by many, but not for your successes, but that one incident that everyone saw. You come to realize that you will forever be remembered as a negative footnote in history and that when your obituary is written, that lowlight in your life will be the primary focus of nearly everyone. And here’s the kicker. You find out a few years later about the fraud. You know that they cheated to wrong you. You realize that the exposure of the hidden scandal will exonerate you and clear your name. But you choose to remain silent. You choose to bare the brunt of criticism for years because your pride and integrity will not speak out and make excuses. That is the story of a real man, One who swallowed his pride and took criticism as the biggest goat in baseball history because he knew the truth and that was all he needed to live with himself. He knew what the real truth was. Ralph Branca, now entering his 88th year on this earth decided to finally open up and let the world know what's on his mind. In a 2011 autobiography, A Moment in Time, he tells his story. As the hurler that served up Bobby Thomson’s “shot heard round the world” in the 1951 pennant clinching playoff, Branca who was for over fifty years labeled as the despondent loser in that historic playoff loss is now finally able to give the world his perspective, not only of that historic game at Coogan’s Bluff, but of his entire life. He has a self-professed photographic memory, which explains why he was the all time winner on the NBC game show, Concentration (with 17 consecutive wins). That memory proves valuable as he recounts his long and interesting life. With older brothers that taught him the ins and outs of football, basketball and baseball. Branca was a fine athlete and he was the largest Branca boy in stature, eventually sprouting to 6’3” and well over 200 lbs. He naturally developed into a power armed right handed pitcher with a blazing fastball. After his sister reached out to the three New York teams regarding tryouts, the lone team that called him back was the Brooklyn Dodgers. As a 17 year old in 1944, Branca had his eyes set on joining the Army in tail end of World War II, but an asthmatic condition and punctured ear drum made him ineligible for any of the branches of service. Instead came a letter to him from Branch Rickey requesting that he report to the Dodgers Montague Street offices in Brooklyn, and that he bring an adult gaurdian along with him to grant him permission to sign a contract. Rickey cut to the chase and offered Ralph a $90/month contract to play with the Dodgers D league team in upstate Olean, New York. Branca eagerly accepted the deal with his mother’s consent. Ralph’s 1944 season as a 17 year old was nothing real impressive. He had a 5-5 record with a 4.63 ERA, but that off season he physically grew. Ralph arrived at Spring Training having added four inches in height and he estimates that his fastball velocity increased five or six MPH in speed, probably to the mid 90's. The major leagues were depleted of many stars due to the war effort. In 1945 he was up with the big club as an18 year old. He bounced between Triple A Montreal and Brooklyn but he was around enough to start 15 games for the Dodgers going 5-6 with a 3.04 ERA over 109 innings. Still a teenager. Branca took a bus and two different subways to travel to Ebbets Field for games. He continued to do so up until he was married following the 1951 season a full six years later. With his increasing salary as the years passed, he bought his parents a larger home in Mt. Vernon and he continued residing there with them. Branca was a kid. He was only a few months removed from being a fan. He soaked in the special experience and enjoyed it from the word go. He talked of how he’d jump on the subway on the way back home and kids would engage him in conversation on public transit almost all the way back to his home. “They’d walk me to the subway and several would actually ride the train with me through Brooklyn, Manhattan and the Bronx. They were young teenagers, 12, maybe 13 years old-and of course I was still a teenager myself. They’d ask questions about the game. How do you pitch to Stan Musial as opposed to Mel Ott? How do you throw a slider. What’s it like to be on the same team as Dixie Walker? I loved talking to those kids, I enjoyed their company. It was only a few years before that I was their age, dreaming the same dreams dancing through their heads. This was a time when players were approachable and actually moved and worked among the fans.” It's hard to imagine a similar circumstance with players today. As young as Branca was, he was immediately recognized for his leadership qualities. You’d think that Pee Wee Reese would be the man that took the lead with regard to the Dodger players, but when he returned from the war, he approached the young Branca who was 20-21 years old and asked him to be the “team rep” they called it. It wasn’t a position that carried a lot of weight in the pre-union days, but Branca took up causes on behalf of the players such as getting the Cubs to add a restroom adjascent to their dugout and representing the players in minor grievance issues. This leadership role would follow Ralph throughout his career and later in life as he helped organized the Baseball Assistance Team (BAT) to aide retired players that were experiencing financial problems and were in need of medical/psychological assistance. What few seem to remember was the influence Branca had in assisting the acceptance of Jackie Robinson as he entered on to the scene. 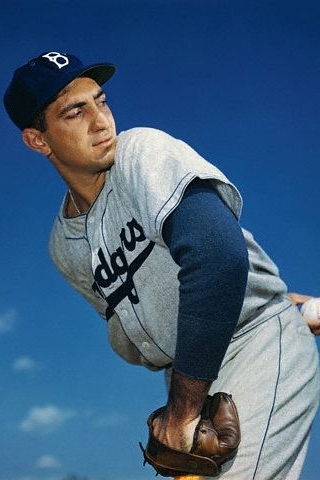 Not only did he serve a leadership role and as an example in that aspect with the Dodgers in 1947, but it would coincide with his greatest season in the majors. 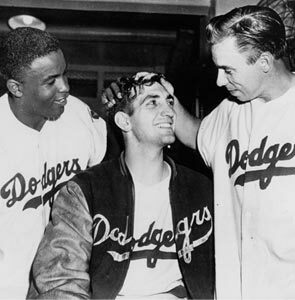 When Jackie Robinson emerged on the scene in 1947, it was Ralph Branca that argued with a handful of players who had ingrained racist sentiments that opposed his roster addition. Yes, Leo Durocher challenged the whole team that dared submit a petition against the move and there was Pee Wee Reese who put his arm around his teammate before a crowd of racist hecklers in Cincinnati. 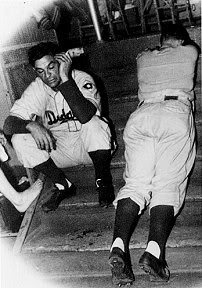 Each scenario played a pivotal role in Jackie's acceptance with the team, but when death threats flowed into the Dodgers mail room claiming Jackie would be shot on the field on his first day in uniform, only one player made it a point to be by Jackie's side when the players lined up and were introduced on opening day. That was Ralph Branca. A few days earlier, when it was announced that Jackie was on the opening day roster, Branca made it a point to be the first player to shake his hand. Ralph felt he had to take a stand for the right and he took his team rep position seriously attempting to smooth over relationships from some of the players on the team with roots from the south. Branca freely admits that it was Robinson’s play and integrity that cut down the barriers and gained him acceptance. All the while that Robinson was on his way to winning the first ever Rookie of the Year award in '47, Branca was having his best season ever. He started the All Star game and he finished 21-12 with a 2.67 ERA, (third best in the league). At age 21, he was the youngest pitcher to ever start Game 1 of the World Series. It was a disappointing World Series for Ralph, as the Dodgers lost 4 games to 3, and he faltered in game one. Burt Shotten failed to start him again after the game one loss. It’s a decision that irritates him to this day. He was the ace of the Dodger staff, a 21 game winner, and after one bad outing against the Yanks, even though he was well rested, the decision was made to not start him again in the series. Ralph is convinced that the Dodger first World Series championship would have been in 1947 had he started another game in that series. Seasons of 14-9 and 13-5 followed Branca’s 1947 season. He was an all star representative in each season, but arm problems plagued him due to overuse that occurred in his first years. Branch Rickey believed that starting pitchers needed only two days rest and in Ralph’s second year in organized ball, he used him as a test case for his theory. Now, a full six years later, after a 20 win season, three all star appearances and numerous arm ailments, it was1951 and things were looking up for Ralph Branca. He was pitching well and the ball club was way ahead in the pennant race. His sore arm was feeling better during the year and he was engaged to Ann Mulvey, the daughter of one of the Dodger chief executives. And then the cheating happened. “So Leo Durocher, believe me John, he’s the biggest crook, thief, gambler, that ever existed... Anyway, they did it. I said ‘I’ll be damned, they did it.’ They attached a telescope. Herman Franks was taking the signs from the catcher. After one inning he had the signs...we knew every pitch. “Bobby Thomson was in a slump. The time up until he hit the home run (in the playoff game), he gained about 60 points (on his batting average). He admits this himself....he says ‘I was taking the signs up until this time that I hit the home run, but, but, but‘ and he stutters a little bit, ‘I could say yes, I could say no.‘ This is actually in print. In the big papers in New York. And he says, ‘I’d rather say no.‘ He should have said, ‘I know Ralph is a fastball pitcher and he has a little curve but to get me out he’s gonna throw his best pitch, I was looking for the fastball.‘ If he said that and stopped, that would have been fine. So without going into the details of how they got there, I quote Ralph in his own words as he goes through the events on that fateful day, October 3, 1951. Branca was called in to relieve Don Newcombe in the 9th. The Dodgers led 4 to 2. Two runners were on base, one out and Bobby Thomson was coming to the plate. Dodger manager Charlie Dressen decided to remove a tiring Newcombe and bring in Branca. “I inhaled. I exhaled. I checked the runners, Lockman at second, Hartung at third. “I turned and followed the ball’s trajectory. I thought it was going to sink. It had to sink. Branca was inconsolable. Once in the clubhouse, he buried his face on the floor. His teammates left him alone. Jackie eventually approached him and said, “Ralph, it it weren’t for you, we would have never made it this far.” Seeking out his intimate friend and parish priest, Ralph was told that “God chose you because He knew you’d be strong enough to bear this cross.” He had to go on. Life would have to go on. He had to put on the good face. Earlier in the day he had made a dinner commitment with his fiance Anne and Rube Walker and his wife for after the game. He hated to go, he wanted to bury his head in the sand and disappear for a long while. Having to show up in public after the worst moment in his life was an unbearable thought, but he went. He kept his commitment. He received a standing ovation at the restaurant when he walked in. That was Brooklyn. Ralph Branca and his wife Ann. They were married 17 days after the fateful home run against the Giants. I’d love to say that Branca came back strong and that his career recovered, but such was not the case. He was never a successful pitcher in the big leagues again. At the time of the Thomson homer, Ralph was 25 years old. A freak accident in which he slipped on a coke bottle messed up his back during spring training in 1952. By July, adjustments in his mechanics to compensate for the hurt back had injured his arm. His season was limited to 61 innings. Then seven games in to the following season before the Dodgers traded Ralph to the Tigers. He was devastated. The ’53 team may have been the best Brooklyn club ever, but Branca’s injuries were just too much. 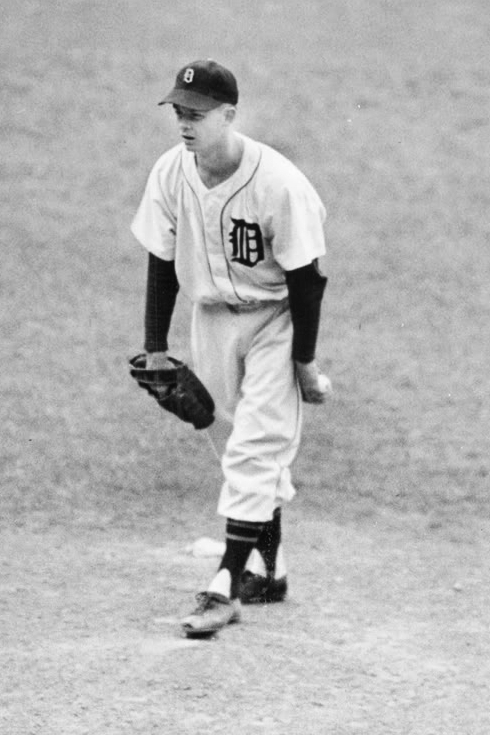 He faltered in Detroit and by 1954, the Tigers released him. He made a brief comeback attempt after Casey Stengel agreed to try him out and by September, he was a Yankee, where he pitched well during his one month stint with the club in September. But as dumb luck would have it, that happened to be the lone season that the Indians beat out the Yanks for the A.L. pennant. It was during the previous year though, when Branca's life took a turn due to a simple conversation with a teammate, affecting him the rest of his life. When the ever personable Branca languished in Detroit on a second division team that ended up 40 games out of first place in 1953, he struck up a very strong friendship with teammate Ted Gray. Gray was his roommate and confidant while he played in the Motor City. It was during one of those long road trips that Gray told him that he had received second hand news from a former Giants player (Earl Rapp) that indicated that the Giants had stole the pennant in ’51 by using a sophisticated method of sign stealing. It involved using a high powered telescope and electronic buzzer system. Ted Gray, Branca's roommate with the Tigers, informed him of the cheating scandal that the Giants pulled off in 1951. Ralph was floored. He asked a number of questions to Gray that only someone on the inside could answer. It was also reported that the players on the Giants bench would say key words such as “sock it!” for fastball, “be ready!” for curve and “watch it!” for change up. Another fail safe measure was backup catcher Sal Yvars in the bullpen that would provide visual signs (such as tossing a ball up and down, or folding his arms while standing in the far off bullpen in order to indicate what pitch was coming). Electronic signals, a telescope, verbal commands, visual signals. There were so many mechanisms in place. No wonder the Giant dugout went nuts when Thomson took a fastball right down the heart of the plate on the first pitch. “I couldn’t sleep at night,” wrote Branca. I couldn’t sleep the next night. I kept tossing and turning. After the initial shock, my first reaction was rage. I was infuriated.” So he called his boyhood pal, former Giants backup catcher Sal Yvars (quoted above). Sal was now a Cardinal and Ralph knew he felt no loyalty to Durocher. “Say it isn’t so, Sal,” said Branca. “Who told you,” he responded. Sal Yvers, the Giants bullpen catcher that relayed signs was also Ralp Branca's boyhood friend from Mt. Vernon, NY. Branca came to find out from Yvars that the sign stealing with the telescope was expanded to when they were on the road too. It was more difficult to pull off, and they obviously didn't have a buzzer system, but there would be signs relayed from the outfield telescope holder to the bullpen, then relayed by signs and verbal mechanisms in the dugout. The whole thing was very sophisticated. What would have happened had Branca reported the incident? That’s tough to say. A possible investigation, or maybe the commissioner’s office turning a blind eye to it and stating it was a case of sour grapes on Branca’s part. It is now known that not only was the entire Giants team and coaching staff involved, but even Giants owner Horace Stoneham was in on it. Electricians were used. Cabling had to be run. This was a job that required a lot of work and some skills. Sanctions against the Giants? Having a public disclosure that would have tarnished the game, in a similar vein as the Black Sox scandal. Then there was Durocher, who already had been suspended for a year once. He would probably face a lifetime banishment. It's important to remember that the Thomson home run was already known in the baseball world of probably the most famous homer ever hit. How kindly would the baseball hierarchy have taken the news that their greatest moment was perpetrated through fraud? It might destroy the sport. Branca had to be looking at the big picture. His complaints very likely would have fallen on deaf ears. Ralph never even considered reporting the incident. If someone else did, that would be their business. But he wouldn’t do so. His wife suggested he file a complaint with the commissioner’s office. “I don’t want to be seen as a sore loser,” he replied. Weeks later he told his brother, John, in confidence. His brother was livid. But he refused. He let the truth sit until someone else reported it. He waited 50 years. 50 years! Kept it inside. Incredible. Branca played a minor role helping the Dodgers win the '55 World Series, providing a detailed scouting report of his former Yankee teammates. 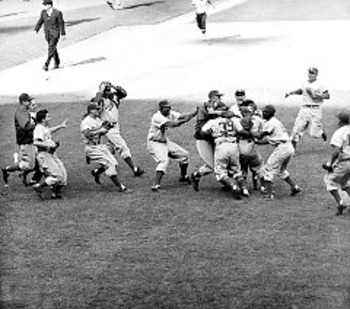 In ’55 when the Dodgers faced the Yankees again in the World Series. Dodger coach Bily Herman called on Branca to provide a detailed scouting report on the Yankees, since he played with them the year before. Branca obliged and it was very detailed down to the lowliest hitter on the bench. The Brooklyn Dodgers won their first and only World Series. It was nice to know that Ralph played a small part of that, evenif he didn't play. He sat in the stands and watched his friends celebrate. It was bitter sweet. The next year, after a long lay off, his arm felt a lot better. He would come down to Ebbets Field and pitch batting practice for the club. Buzzie Bavasi signed him to a September contract and he pitched twice. Those were his final major league appearances, against the Giants. He took the trip to Japan with the club after the series and proudly wore the Dodger uniform one last time, but his arm was killing him. In Spring Training 1957, Ralph retired from the game for good. He was happy that it was as a Dodger. What followed was a very successful career in insurance sales. Working in an office above Grand Central Station in New York City, Branca became a skilled salesman. It helped that he had a known baseball name and that fact would often give him an opening to a sales pitch. Even if the potential buyer mentioned the Thomson homer, it didn’t matter. Ralph had a connection and ability to close a sale. He raised his family with Ann and remained in New York. Able to survive in the business world and become highly knowledgable in the insurance industry, the Brancas lived a comfortable life and also remained connected with baseball. He participated in Mets activities and had some TV opportunities with the new club. Gil Hodges and the Brooklyn connections kept him engaged in baseball. The controversy of the Thomson homer lingered though. 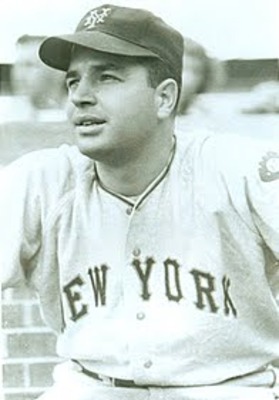 In 1963 Howard Cosell interviewed him and brought up the possible cheating scandal that the Giants had engaged in during the ’51 pennant stretch. He had done some research and received information about the telescope and buzzer system. When interviewed, Ralph took the higher ground, saying he heard something about it, but wouldn’t talk. As Cosell prodded further, Branca became more insistent. “Howard, What part of I don’t want to talk about it don’t you understand?” he said. Surprisingly, Cosell backed off. When Durocher and Thomson were questioned about the cheating, they denied it occurred. The press backed off too and the story went no where. But it never completely went away and connections between Branca and Thomson would surface again and again. Ralph was bitter about the whole thing. When he’d run into Thomson, he became more distant with him. It ached him that he was shaking the hand of a man that knew he had cheated him. Bobby wasn’t too comfortable in those settings either. At an Old Timer’s game at Shea Stadium, Branca faced Thomson and the crowd really lit in to Ralph. A lot of negative insults were shouted his way. Durocher, who was present, wouldn’t look Branca in the eye and avoided him at all costs. When Ralph's granddaughter asked about it, Ann told her that people just don't understand what the truth is. 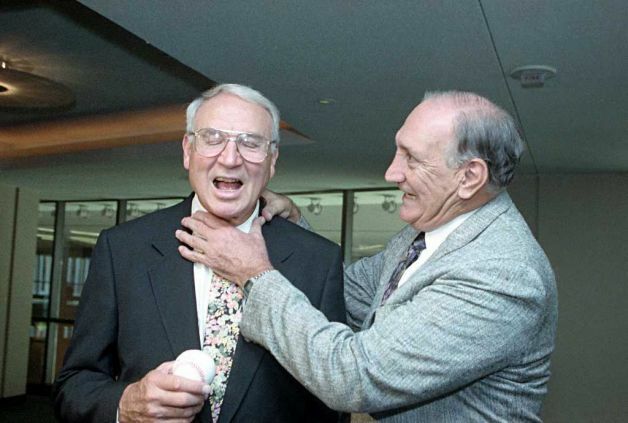 1991 AP photo of Bobby Thomson and Ralph Branca on the 40th anniversary of the home run. At the time, the cheating scandal had still not been exposed but Branca and Thomson were friends. It wasn’t until the 1980s that things between Ralph Branca and Bobby Thomson became less frigid. A promoter asked Ralph to participate in a card show with Thomson. Card shows were a new phenomenon and they were great money making opportunities for ex-ball players. Branca agreed to sign a bunch of pictures for an hour with Bobby for $1,000. “Maybe it’s time to let bygones be bygones,” he thought. He attended and the two men sat at a table together and sincerely talked for the first time at length. The event was a tremendous success and fans loved it. Before long, the two former rivals were friends. They got to know each others families. They joked. They laughed. They talked about everything almost, everything except the cheating scandal. Branca negotiated their signing deals at Thomson's behest as he was an extremely skilled negotiator. They made hundereds of thousands of dollars over the years. It was about twenty years later when the Prager WSJ article surfaced in 2001, they finally talked about it the topic that had nagged Ralph for 48 years. “I think, Ralph, that you must feel exonerated,” said Thomson. “I don’t feel exonerated, but my tongue is definitely loosened, “ he replied. 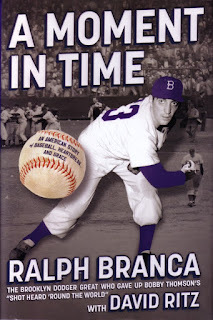 One last story about Ralph Branca. We all are aware of the movie "42" that will be coming out in April on the life of Jackie Robinson. I have to wonder how Ralph will be portrayed in the movie or if he even was consulted while it was made. In Jackie's rookie year as a Dodger, there was a pop up that he chased down near the dugout at full speed. As he caught the ball he came barreling hard into the Dodger dugout. It was Branca that tackled him before he fell into it to potential injury. It was a gesture that Jackie appreciated, as it was early in the year and there was still some tension with teammates. Branca joked to Jackie that he was one of the few people on earth who could ever successfully tackled Robinson, referring to his days as a half back with UCLA. In 1972, after Gil Hodges died suddenly of a heart attack during Spring Training while he was manager of the Mets. It was a shock to many and several of Gil's old teammates attended the ceremony. When Ralph drove to Brooklyn to attend the wake, he noticed as he approached the church, Jackie Robinson was driving in the lane next to him. Ralph honked, but Jackie was focused on the road and took no notice of him. He found out why when they both pulled into the parking lot. Jackie's diabetes had really affected his eye sight and it took total concentration for him to drive as he focused on the road. He was really struggling as he got out of the car, having difficulty steadying himself as he walked, bracing himself against his parked vehicle. Ralph approached and they embraced, and Ralph latched on to Jackie's arm. He was having trouble walking on the uneven sidewalk. "It's the diabetes, Ralph, it's affecting my vision." 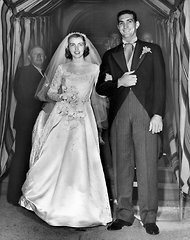 They entered the grounds of the church and Jackie stumbled on the uneven pavement, but Ralph was able to hold his arm tight and catch him before he fell. "Just like '47, Ralph," he said, "When you tackled me before I crashed into the dugout." He had remembered that incident like it was yesterday. Six months later, Ralph was a pall bearer at Jackie's funeral.